Ministry of Propaganda - 11/Jun/2006: "IslayBlog Goes Live (Shameless Plug)"
The last few weeks it has been fairly quiet here for a number of reasons. Busy at work, lack of ideas, a variety of things. And that I spent quite a bit of time working on my new second blog, IslayBlog.com. 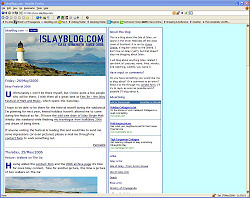 2.5 weeks ago I blogged that IslayBlog.com had gone beta, I think now it's ready enough to 'go live', time for another plug here. Since the first entry almost three weeks ago I've added 15 more entries about a number of topics. I hope they give a flavour of what I'm planning to do with the blog. I'm not sure how interesting it will be for other people, but knowing that a lot of people like Islay I hope to find a few readers. And to get those readers I have to promote it a bit, hence the shameless plug here. In other words, head over to IslayBlog.com, take a look and if you like it subscribe to the RSS feed for IslayBlog.com. When writing this entry the weather was: Mostly sunny, a few light clouds. Very warm!